When it comes to versatile design elements for your home’s landscaping, landscaping walls rank right up there at the top of the list in the Virginia Beach area. In addition to providing you with an extremely attractive and useful landscaping feature, tastefully designed and built landscaping walls can help you add a great deal of value to your property for a fairly reasonable price, especially when they are constructed from the right quality materials. In fact, adding a new, high quality landscaping wall to your Virginia Beach property might actually be one of the easiest and most affordable ways out there to help you enhance the function of your landscape design while adding value to your property at the same time. Landscaping walls are highly durable, environmentally friendly, and highly versatile in terms of their design with the sheer number of stone types, colors, and textures that you have available to choose from. If you are on the fence, so to speak, about investing in a new garden wall for your home, our team of landscaping professionals have taken the time to put together this short list highlighting just a few of the many benefits that come along with investing in retaining walls for your property. It is very easy to lose soil on your property if you have any steep areas where the dirt can get washed away when it rains. One of the best things you can do to enhance the stability of your home’s landscaping and keep everything from washing away when the rain starts coming down is to invest in a high quality landscaping wall. Adding a landscaping wall to your property will help you fight against the movement of the soil and keep everything right where it needs to be, regardless of what the elements choose to throw at it. Incorporating a landscape wall into your home’s landscaping design can be a great investment over time as it will help to prevent erosion and mitigate any of the problems that can sometimes come about as a result of excessive rainfall. If you have any hills or slopes on your property, it might be worth considering all of the extra space that you could have to utilize by adding a new landscaping wall. Despite what some might think, adding a tiered landscaping wall can actually help you free up more space on your property, giving you and your family area to enjoy in your outdoor spaces. 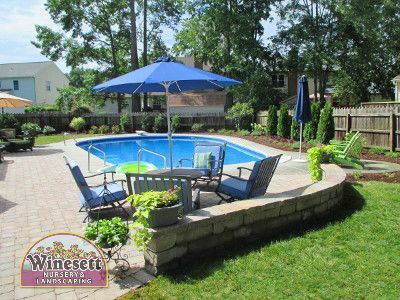 Whether you are looking to free up space to give you and your family room to throw the ball around after work, to help increase the amount of space you have at the end of the day to relax in, or you are looking to free up a little bit of area so you can finally hose those backyard cookouts, adding in a landscaping wall might be just the solution you’ve been searching for. If you are like most homeowners, you are acutely aware of just how much damage can be done to your landscaping if heavy rainfall leads to flooding of any kind. Flooding is usually something that occurs with little to no warning, and once it has started, there is very little you can do to actually stop it. A properly constructed landscaping wall, however, can actually act as a second line of defense for your property, and help deter any floodwater from washing away your carefully maintained landscaping if the rains start to fall a little heavier than usual. If you would like to add retaining walls to your landscaping in Virginia Beach, call 757-426-7880 or complete our online request form.